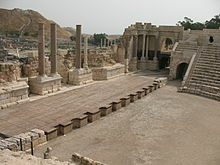 A UNESCO World Heritage site since 2005, Tel Be'er Sheva is an archaeological site in southern Israel, believed to be the remains of the biblical town of Be'er Sheva. Archaeological finds indicate that the site was inhabited from the Chalcolithic period, around 4000 BCE, to the 16th century CE. This was probably due to the abundance of underground water, as evidenced by the numerous wells in the area. Excavated by Yohanan Aharoni and Ze'ev Herzog of Tel Aviv University, the settlement itself is dated to the early Israelite period. Probably populated in the 12th century BCE, the first fortified settlement dates to 1000 BCE. The city was likely destroyed by Sennacherib in 700 BCE, and after a habitation hiatus of three hundred years, there is evidence of remains from the Persian, Hellenistic, Roman and Early Arab periods. Major finds include an elaborate water system and a huge cistern carved out of the rock beneath the town, and a large horned altar which was reconstructed using several well-dressed stones found in secondary use in the walls of a later building. The altar attests to the existence of a temple or cult center in the city which was probably dismantled during the reforms of King Hezekiah. 在1913年至1914年，Yishuv的知识精英成立了the Socity for the Reclamation of Antiquities。其创始人之一是Avraham Yaakov Brawer，David Yellin和Aharon Meir Mazie。该协会于1920年改名为犹太巴勒斯坦探索协会，后来改名为以色列探险协会。 耶路撒冷的英国考古学院在1921年开始运作，巴勒斯坦探矿基金会的斯图尔特·马卡利斯特和邓肯·麦肯齐先生呼吁英国政府建立一个当地文物当局。 Macalister和Mackenzie表示关注由于战斗在整个土地上战斗给考古遗址带来的危险。麦肯齐对警察考古遗址和偷窃物品也警惕 In 1913–1914 the Society for the Reclamation of Antiquities was established by the Yishuv's intellectual elite. Among its founder were Avraham Yaakov Brawer, David Yellin and Aharon Meir Mazie. The Society changed its name to the Jewish Palestine Exploration Society in 1920 and later to the Israel Exploration Society. 耶路撒冷希伯来大学考古研究所成立于1926年。1934年希伯来大学开设了考古学系，被誉为“以色列考古学的发源地” 特拉维夫大学考古研究所成立于1969. 现代以色列国在1948年成立后， the British Mandatory Department of Antiquities, 设立在洛克菲勒考古博物馆（Rockefeller Museum）的, 成为以色列文物部. 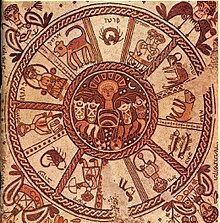 1990年，以色列国家文物部成为以色列文物局（ Israel Antiquities Authority）, 一个自治的政府机构，负责所有国家的文物，并授权挖掘、保存、保护和管理文物. Israeli archaeologists have developed a method of detecting objects buried dozens of meters underground using a combination of seven technologies, among them echomagnetic soundings, radio transmissions and temperature measurements, able to distinguish between relevant and irrelevant objects such as pipes in the ground. Archaeological research and preservation efforts have been exploited by both Palestinians and Israelis for partisan ends. Rather than attempting to understand "the natural process of demolition, eradication, rebuilding, evasion, and ideological reinterpretation that has permitted ancient rulers and modern groups to claim exclusive possession," archaeologists have instead become active participants in the battle over partisan memory, with the result that archaeology, a seemingly objective science, has exacerbated the ongoing nationalist dispute. Silberman concludes: "The digging continues. Claims and counterclaims about exclusive historical 'ownership' weave together the random acts of violence of bifurcated collective memory." Adam and Moodley conclude their investigation into this issue by writing that, "Both sides remain prisoners of their mythologized past." As an example of this process, an archaeological tunnel running the length of the western side of the Temple Mount, as it is known to Jews, or the Haram al-Sharif, as it is known to Muslims, became a serious point of contestation in 1996. The tunnel had been in place for about a dozen years, but open conflict broke out after the government of Benjamin Netanyahu decided to open a new entrance to the tunnel from the Via Dolorosa in the Muslim quarter of the Old City. Palestinians and the Islamic Waqf authorities were outraged that the decision was taken without prior consultation. They claimed that the work threatened the foundations of the compound and those of houses in the Muslim quarter and that it was actually aimed at tunnelling under the holy compound complex to find remains of Solomon's Temple, similar to previous accusations in the 1980s. As a result of the rumor, Arabs rioted in Jerusalem and then spread to the West Bank, leading to the deaths of 86 Palestinians and 15 Israeli soldiers. ^ Encyclopedia of Zionism and Israel, edited by Raphael Patai, Herzl Press and McGraw-Hill, New York, 1971, vol. ^ Ussishkin, David. Where is Israeli archeology going?. Biblical Archeologist. Spring 1982, 45 (2): 93. ^ Dates for Biblical Period follow Amihai Mazar, Archaeology of the Land of the Bible (New York: Doubleday 1990). ^ Old City of Acre. UNESCO. 2001 [2008-02-26]. （原始内容存档于12 March 2008）. ^ John S. Holladay, Jr. Untitled Review of "Beer-Sheba I: Excavations at Tel Beer-Sheba 1969-1971 Seasons" by Yohanan Aharoni. Journal of Biblical Literature. June 1977, 96 (2): 281–284. JSTOR 3265886. doi:10.2307/3265886. ^ 14.0 14.1 Freedman, 2000, p. 161. ^ Tel Beersheva National Park. Israel Nature and National Parks Protection Authority. [2008-02-26]. （原始内容存档于2007-09-27）. ^ Murphy-O'Connor, 1998, p. 438. ^ Ben-Aryeh, Yehoshua. המוסדות הזרים לארכאולוגיה ולחקירת ארץ־ישראל בתקופת המנדט [The Foreign Institutions of Archeology and Exploration of the Land of Israel During the British Mandate (Tammuz 1999)] (PDF). Cathedra (Yad Yitzhak Ben-Zvi). 1999, (92) [2013-03-30]. （原始内容 (PDF)存档于2015-02-06） （希伯来语）. ^ Hasson, Nir. Israel's archeological triumphs through the eyes of a man who was always there. Haaretz. 2013-03-29 [2013-03-30]. ^ About the Israel Exploration Society. Israel Exploration Society. [2013-03-30]. ^ Institute of Archaeology – History. The Hebrew University of Jerusalem. [2013-03-30]. （原始内容存档于2013-09-26）. ^ About us – Institute. Tel Aviv University. [2013-03-30]. ^ Baruch, Yuval; Kudish Vashdi, Rachel. 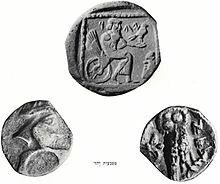 From the Israel Department of Antiquities to the Founding of the Israel Antiquities Authority. Israel Antiquities Authority. [2013-03-30]. ^ IAA Law. Israel Antiquities Authority. [2013-03-30]. ^ Lidman, Melanie. Israel Antiquities digitalizes archives. The Jerusalem Post. 2013-01-16 [2013-03-30]. 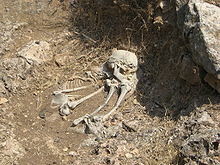 ^ A founding father of Israeli archaeology. Biblical Archaeology Review (Biblical Archaeology Society). May–June 2004, 30 (3). ^ 27.0 27.1 Heibert, Adam. Peace-Making in Divided Societies – The Israel-South Africa Analogy (PDF). Cape Town, South Africa: Human Sciences Research Council Publishers. 2002 [2011-07-12]. ISSN 1684-2839. （原始内容 (PDF)存档于2015-09-24）. ^ Ross, 2007, pp. 156–157. ^ Letter dated 5 March 1968 from the permanent Representative of Israel to the United Nations addressed to the Secretary-General. United Nations. 1968-03-06 [2008-02-19]. （原始内容存档于2007-02-16）. ^ Sachar, Howard M. A History of Israel: from the Rise of Zionism to our Time 3rd. New York, NY: Alfred A Knopf. 2007: 436. ISBN 978-0-375-71132-9. ...a road was cut through the Jewish cemetery on the Mount of Olives, and the headstones of Jewish graves there were used for building purposes, some of them footpaths to army latrines. ^ United Nations Educational, Scientific and Cultural Organization, Convention Concerning the Protestion of the World Cultural and Natural Heritage. UNESCO. 1983-01-17 [2008-02-20]. （原始内容存档于16 March 2008）.